I don’t often put my family pictures or others from my private life on My London Diary, except for some largely landscape images from some of the walks we do together – such as those along the Thames Path earlier this year. And an occasional image of my family sometimes creeps into these. 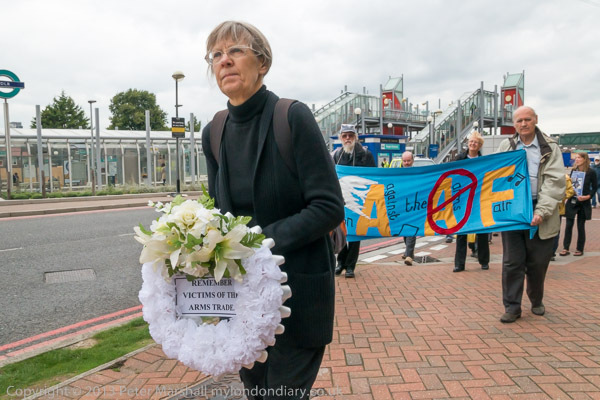 But Wreath for Victims of London Arms Fair is an example of where my private and public lives rather overlap, with my wife playing a major role in the event. It more or less happened by accident. Although she doesn’t often accompany me to protests, this was one time when she was free and had decided to take part in, and as the organisers requested she had dressed in black for the occasion. 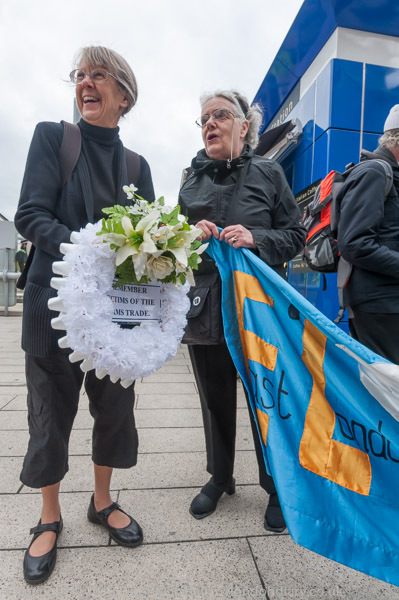 She isn’t a member of East London Against the Arms Fair (who organised the event) because we live to the west of London, but when she arrived she was asked if she would lead the procession carrying the wreath around Royal Victoria Dock., and so has a leading role in my pictures. 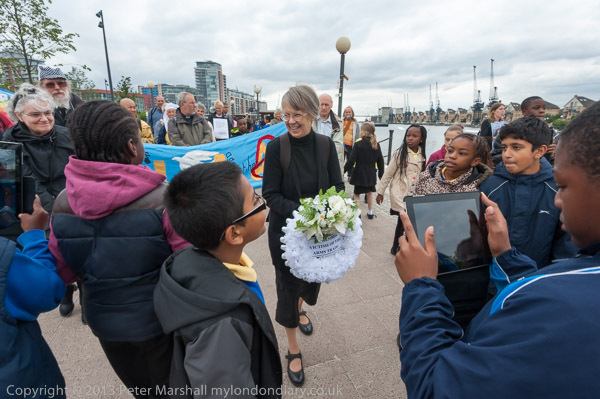 I had serious photographic competition from a number of young reporters from the local primary school who had come along to view the event as a part of their school projects. They were also interviewing people, though when asked about my experiences in the Second World War I declined to answer on grounds of age. 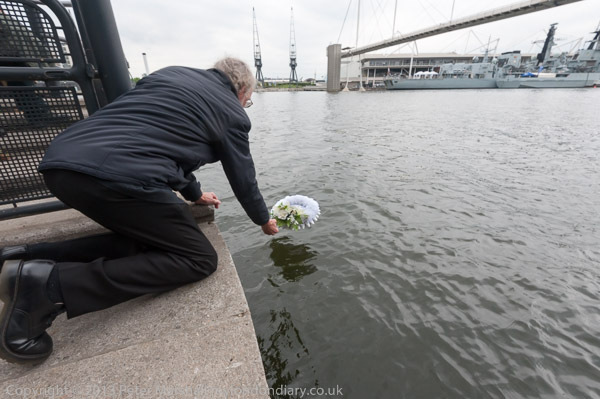 Linda handed the wreath over to one of the ELAAF members for the short ceremony when the wreath was floated on the dock. It would have been better to have photographed this from a boat, but I hadn’t brought one with me, so was crouching as close as possible on the dock side, just a little worried as I leant out about falling in. I wanted to get some of the several warships moored at the arms fair in the background, so was working with the 16-35mm. The shoe at the left of the image was pretty close to me and sharp, but the ships in the distance are out of focus. But importantly the wreath is sharp. It might look better if I cropped the image at left and bottom. Afterwards I switched to the 18-105mm to frame the wreath floating on the water before it moved too far away; fortunately most of the message on it was still visible. 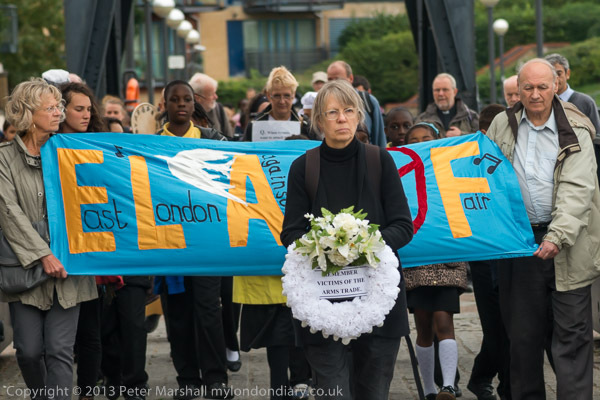 You can see that and the other images at Wreath for Victims of London Arms Fair. This entry was posted on Friday, October 18th, 2013 at 11:09 am and is filed under My Own Work, Political Issues. You can follow any responses to this entry through the RSS 2.0 feed. You can leave a response, or trackback from your own site.